The big story for the 2018/19 season centres on improvements in the Ripper Zone. Ripper Zone will be a focal point for on-mountain enhancements over the next two years. Revelstoke is home to some legendary glade skiing and the Ripper Zone is no exception. Over the course of the summer, the Resort completed an extensive glading program in Powder Monkey Glades and the Lower Back 40 Glades. Skiers and riders can look forward to improved spacing and some new line choices in both of these areas. There will be two new runs added to the Ripper Zone for the 2018/19 season, named Blow Down and Simmer Down Glades. A number of run improvements and earth work have also been completed, providing an improved experience for intermediate skiers and riders. A new warming hut has been constructed atop the Ripper Chair. This new facility will provide skiers and riders with a place to escape the elements or store a daypack. The Downtowner has gone through a major overhaul that included plenty of rock blasting and earth work. The new green route provides a friendly alternative for beginners and facilitates easier access to the front side of the mountain. Hands-free convenience is here. New for 2018/19, Revelstoke Mountain Resort lift tickets and passes are equipped with the latest RFID technology. This means no more fumbling with your ticket or pass when trying to board the lift. Please note, all Season Passholders will be required to pick up a new RFID enabled Season Pass. Building off of a partnership that was established with PRINOTH last year, the Resort will be adding two additional PRINOTH snowcats to its grooming fleet for the upcoming winter. These new snowcats will help the Resort maintain its reputation for world class groomers, particularly on top-to-bottom classics like Snow Rodeo that descend the most vertical in North America, 5,620 vertical feet. A new hard goods store named Critical Parts is open at the base of the Resort. Critical Parts will feature the latest gear from Salomon, Atomic, Faction, Lange, Full Tilt, Jones, Never Summer, Trapper Snowboards, BCA, Black Diamond and more. Critical Parts will also have three certified boot-fitters on staff to help skiers find the perfect fit. 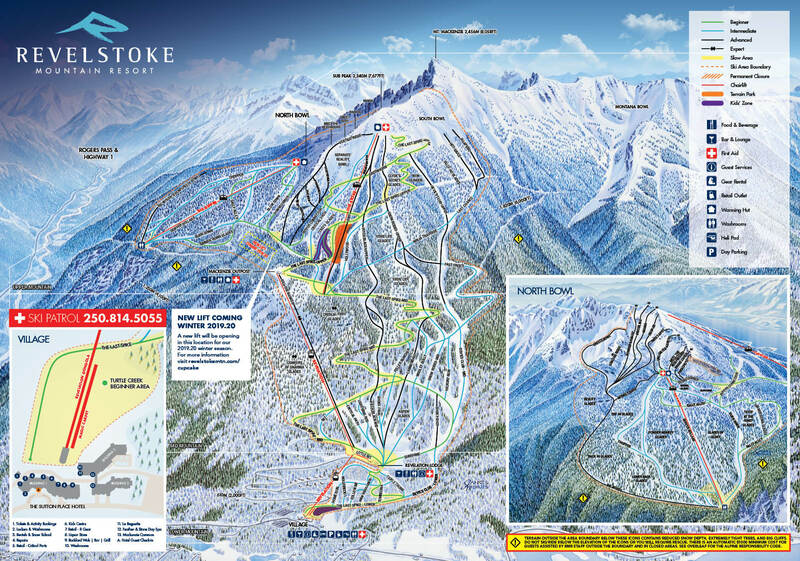 Alongside the developments outlined above, the Resort has also begun planning for the 2019/20 season, which includes the installation of a new lift and capacity increases on the Revelation Gondola, Ripper Chair and Stoke Chair. In an effort to further enhance the Ripper ski experience, an additional lift will be constructed for the 2019/20 season in an area between the Ripper Connector and the Revelation Gondola. This new lift, named the Stellar Chair, will provide a direct link to the Ripper area from the top of the Gondola. The Stellar Chair will have an upload capacity of 1,800 people/hour with a travel time of just over three minutes. The Stellar Chair will also feature a new beginner/intermediate terrain pod with 6 new runs. An increase of capacity on all lifts has been confirmed for the 2019/20 season. The Resort recently added 24 cabins for the 2017/18 season, increasing the capacity by 25%. For the 2019/20 season, the Revelation Gondola will increase to full capacity fo 2,800 people/hour with an additional 22 gondola cabins on order. For the 19/20 season, The Ripper Chair will receive a 22% increase and the Stoke Chair will receive an 18% increase in capacity, allowing it to carry 2,600 people per hour.